I came across this book last month in an email from Dynamic Catholic. I was immediately captured by the title. I knew this was a book I had to read. And I picked up the eBook the day after that email. And boy did I need to read this book. And I know I will read it again and again. I read this book in one day over three sittings this first time through. And have already put it back in my reading list to reread it in a few months and take my time with each chapter as I do. "I grew up believing that I was only "lovable" if I got my act together. I had to be a "good boy" to be worthy of God's love, or anyone else's. Be perfect (read: be a "saint") and then you'll be loved. Such was the impression made on me by a falsely pious upbringing. Having shared my story with audiences around the world, I know I'm not the only recovering perfectionist out there. It's a sadly common but tragically misguided impression of what it means to be Catholic. There is so much wrong with this view, not the least of which is what it means to be a saint. Saints are not perfect people. They are people who know that they are perfectly loved in all their imperfections. They abide in that love and it fills them with the infectious joy of the gospel." "While many of the lessons I've learned flow from my experience as a married man, these reflections are not only intended for married people. Regardless of a person's state in life, every one of us is involved in a great variety of human relationships, all of which can benefit from entering more deeply into St. Paul's hymn to love." 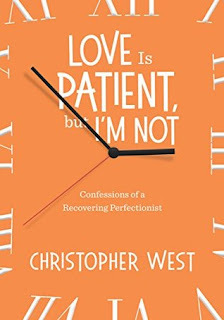 And from this starting point Christopher West goes on to give so many personal examples from his own life and his own struggles that You cannot help but be inspired to work for change in your own life. "Love is patient. Oftentimes, I am not. Lord, teach me to love. How do I respond when others inconvenience me or act in some way that I'd rather they didn't? Am I quick to react with dismay, disdain, or aggression? What experiences shaped me growing up that may be affecting the way I respond to others' and my own faults throughout the day?" There are between 1 and 4 of these reflection sections in each chapter. The chapters with only one are at the end of the chapter, those with more are interspersed through the chapter. At first, this might just sound like "standard Catholic stuff" that you've heard before. Sure enough, it is. But John Paul II's "spousal theology" gives us a fresh, mystical perspective that you probably didn't hear about growing up in the Church. I'd like to conclude this book by taking a brief look at how his "spousal lenses" illuminate this path of authentic marital spirituality." And then he proceeds to expand on each of those three points. As stated this was a book I really needed to read. And will read again and again. This might become one of those books I read yearly for years to come. The lessons are simple and clear. The examples at times warm and encouraging and at times raw and completely transparent and vulnerable. Thank you, Christopher, for sharing so much or your own story in this book. And thank you Beacon for publishing it for Dynamic Catholic. Last year I was pressured to create a list of my Top 10 Catholic Books List if I were to be doing it today this book would be on it! It is a book I need and a book that will help almost anyone in their relationships, with spouses, children, coworkers, and with friends. An excellent read! This sounds like a good read and one that would benefit many of us!